material for the sensing application. interfacial, intra- and intermolecular forces . concerning micellar properties of the TX100 system. 100, 99%) was purchased from Sigma Aldrich, USA. Elmer) in the frequency range from 400 - 4000 cm–1. TX-100 and affinity of TX-100 with PANI matrices. found in the doped state. dation or protonation state of emareldine salt form [9,10]. 1600, 1460, 1351, 1298, 1246, 1184, 1124 and 953 cm–1. 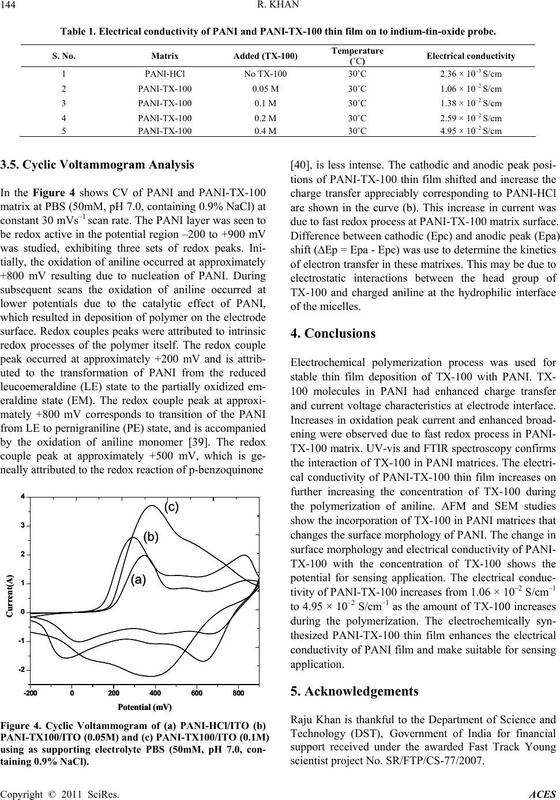 PANI-TX100/ITO (0.05M) and (c) PANI-TX100/ITO (0.1M). using Scanning Electron Microscopy (SEM) respectively. of available active cites on PANI film surface by TX-100. strongly on the surface of PANI-TX-100. nonionic surfactants TX-100 are summarized in Table 1. Table 1. 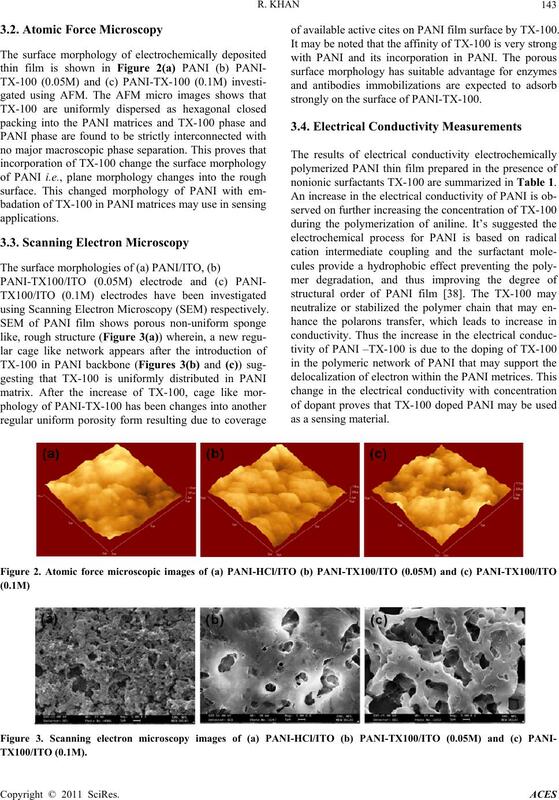 Electrical conductivity of PANI and PANI-TX-100 thin film on to indium-tin-oxide probe. due to fast redox process at PANI-TX-100 matrix surface. and current voltage characteristics at electrode interface. 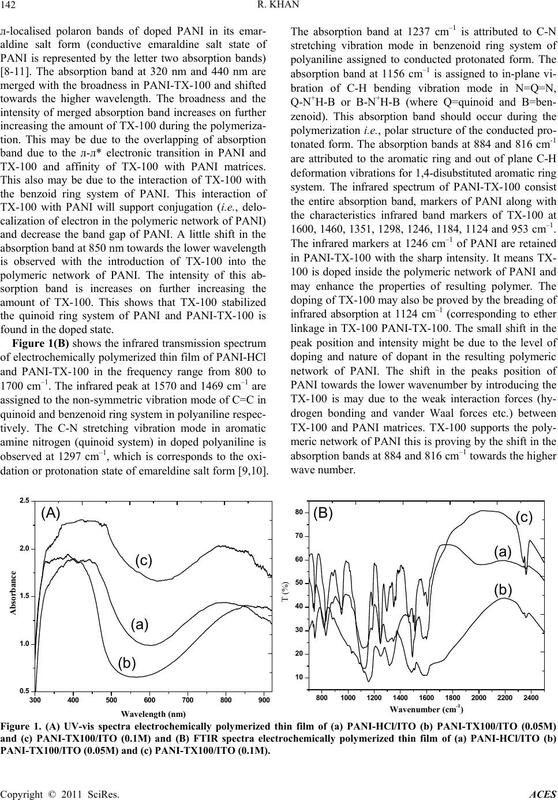 trode and Conducting Polymers,” Synthetic Metals, Vol. 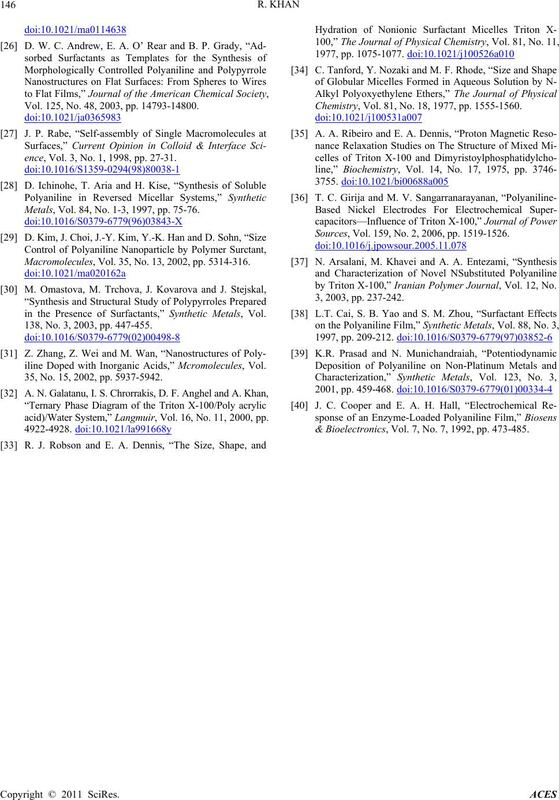 K. S. Ryu, K. M. Kim, S. G. Kang, G. J. Lee, J. Joo and S.
Metals, Vol. 110, No. 3, 2000, pp. 213-217. A. Talei, J. Y. Lee, Y. K. Lee, J. Jang, J. A. Romagnoli, T.
Films, Vol. 363, No. 1-2, 2000, pp. 163-166. A. Kumar, D. M. Welsh, M. C. Morvant, F. Piroux, K. A.
with High-Contrast Ratios,” Chemistry of Materials, Vol. 10, No. 3, 1998, pp. 896-902. Synthetic Metals, Vol. 85, No. 1-3, 1997, pp. 1197-1200. Film,” Thin Solid Films, Vol. 360, No. 1-2, 2000, pp. ics, Vol. 24, No. 6, 2009, pp. 1700-1705.
nology, Vol. 9, No. 8, 2009, pp. 4679-4685. A. Kaushik, R. Khan, V. Gupta, B. D. Malhotra and S. P.
 A. Kaushik, J. Kumar, M. K. Tiwari, R. Khan, B. D.
technology, Vol. 8, No. 4, 2008, pp. 1757-1761. Copolymers,” Synthetic Metals, Vol. 4, No. 2, 1991, pp. Y. Z. Zheng, K. Levon, T. Taka, J. Laasko and J. E.
WO 92/2291, Vol. 91, 1992. Vol. 27, No. 24, 1994, pp. 7212-7214. Metals, Vol. 65, 1994, pp. 103-116. A. G. MacDiarmid, Y. N. Xia and J. M. Wiesinger, U.S.
Patent 5, 773, 568 (1998). cal Communication, Vol. 2, 1989, pp. 88-89.
rsion,” Synthetic Metals, Vol. 150, No. 2, 2005, pp. 107-14. 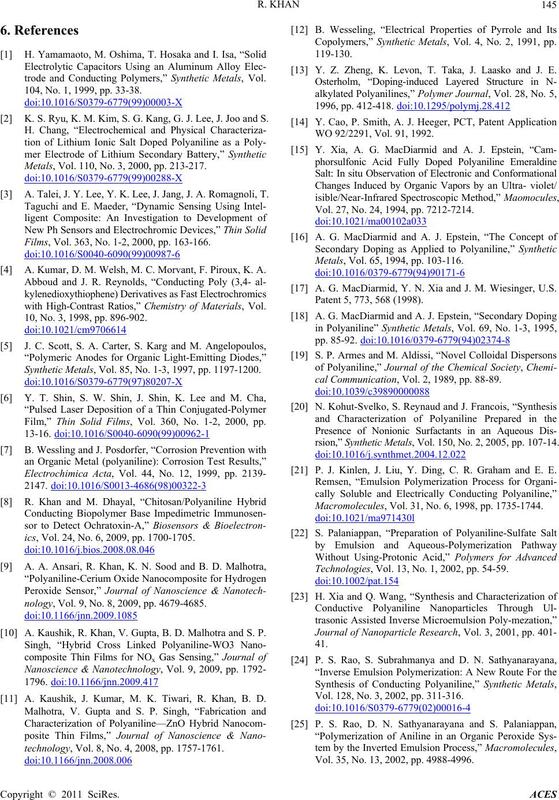 P. J. Kinlen, J. Liu, Y. Ding, C. R. Graham and E. E.
Macromolecules, Vol. 31, No. 6, 1998, pp. 1735-1744. Technologies, Vol. 13, No. 1, 2002, pp. 54-59. Vol. 128, No. 3, 2002, pp. 311-316. Vol. 35, No. 13, 2002, pp. 4988-4996. Vol. 125, No. 48, 2003, pp. 14793-14800.
ence, Vol. 3, No. 1, 1998, pp. 27-31. Metals, Vol. 84, No. 1-3, 1997, pp. 75-76. Macromolecules, Vol. 35, No. 13, 2002, pp. 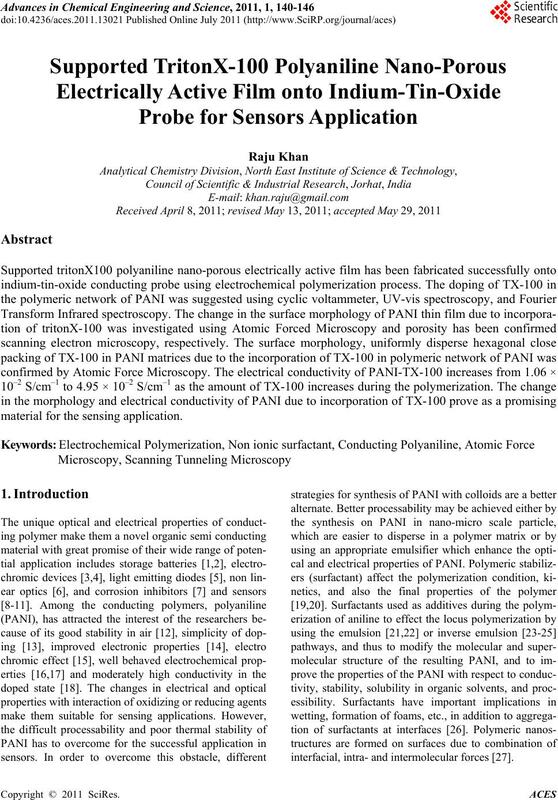 5314-316.
in the Presence of Surfactants,” Synthetic Metals, Vol. 138, No. 3, 2003, pp. 447-455.
iline Doped with Inorganic Acids,” Mcromolecules, Vol. 35, No. 15, 2002, pp. 5937-5942.
acid)/Water System,” Langmuir, Vol. 16, No. 11, 2000, pp. Chemistry, Vol. 81, No. 18, 1977, pp. 1555-1560. Sources, Vol. 159, No. 2, 2006, pp. 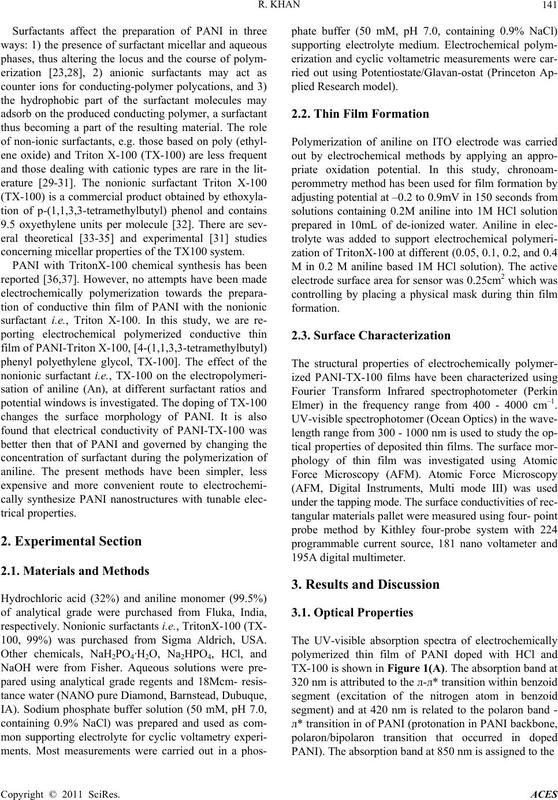 1519-1526.
by Triton X-100,” Iranian Polymer Journal, Vol. 12, No. & Bioelectronics, Vol. 7, No. 7, 1992, pp. 473-485.